At one time humans obtained most of their calories from food. That changed with the arrival of cheap sugar, and then cheaper high-fructose corn syrup. 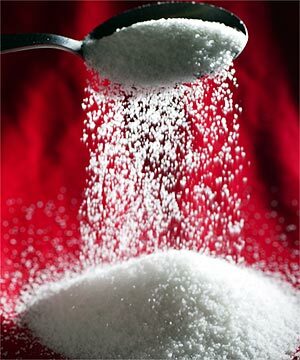 In the late 16th century, a teaspoon of sugar cost the equivalent of ten pounds in London (1). Nowadays, 1 teaspoon of sugar costs approximately one pence (2). Sugar added to food now accounts for nearly 16 percent of the average American’s daily intake; sweetened soft drinks make up nearly half of that (3). In Britain, government statistics indicate that 14.2 per cent of the calories in the average diet come from added sugars (4). Researchers at Glasgow University asked 2,005 people from across the UK to estimate how many teaspoons of sugar were in some of the UK’s most popular drinks (5). Those surveyed were also asked to estimate their average weekly liquid consumption in detail. 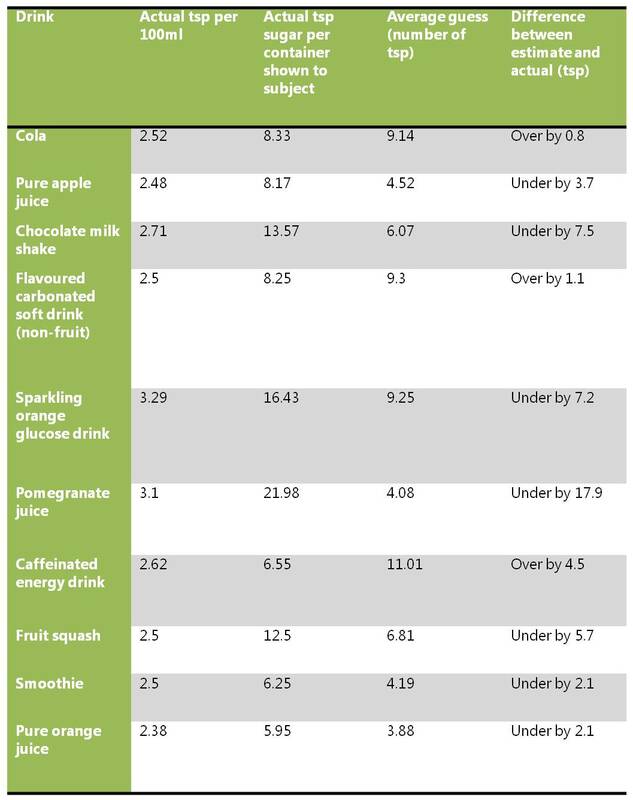 The findings suggest that the average person in the UK consumes 659 grams of sugar and 3,144 calories per week (which equates to 450 calories per day) through non-alcoholic liquid intake. This is the equivalent of nearly a quarter of recommended daily calories for a woman and a fifth for men. People underestimated the amount of sugar in a serving of pomegranate juice by an average of 17.9 teaspoons, while they overestimated the amount of sugar in a serving of fruit squash by almost seven teaspoons. 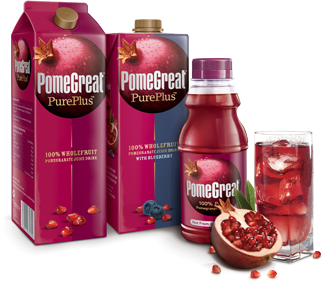 It is worth noting that a number of products state they contain “100% juice” or “100% pomegranate juice”. You need to read the product label carefully because most products contain only 20 to 30 per cent pomegranate, with the rest typically apple or grape juice. “While people sometimes overestimate the amount of sugar in carbonated drinks, they significantly underestimate the sugar levels in smoothies and fruit juices. This analysis confirms that many people are perhaps not aware of the high calorie levels in many commonly consumed drinks. Some varieties of drinks such as pure fruit juices and smoothies which are perceived as “healthy” options are also very high in sugar. For many people struggling with their weight, reducing their intake of such drinks and replacing with water or diet drinks would be a sensible first target to help them lessen their calorie intake. According to information from the British Soft Drinks Association, most soft drinks do not contain sugar. Their data indicate that more than 60 per cent of the soft drinks market is now made up of diet, low calorie and no added sugar drinks, up from 30 per cent 20 years ago (6). It is best to drink water but if you would like a fruit juice, here is a recipe for a watermelon, strawberry and rose water crush, which is relatively low in sugars and calories. While the energy density of soft drinks, which are frequently highly calorific, needs to be considered differently from that of solid foods, recent research has demonstrated that consumption of soft drinks is likely to increase normal caloric intake. When people consume soft drinks, they do not recognise that they have taken in extra energy and compensate by reducing energy from elsewhere in their daily diet, or by expending additional energy; they simply add it on. A standard 330 ml can of Coca-Cola contains 139 calories. Thus if a person were to consume a can of Coca-Cola with two meals per day, over a week that would result in an energy surplus of nearly 2,000 calories-more than a whole day’s recommended calorie intake for the average woman, and about three-quarters of the recommended daily calorie intake for a man. Evidence from the British Soft Drinks Association suggests that children drink an average of 4.7 litres of soft drink per week, of which only 10% are fruit juice or water. Consumption of alcohol, particularly amongst women and young people in the UK, has increased dramatically during the past years. Since 1970, alcohol consumption in the UK has increased by 40 per cent. With most alcoholic drinks being at least as calorific as a high-sugar soft drink, such as Coca-Cola, it would seem intuitive that the massive increase in their consumption has had some impact on the nation’s weight. Much attention has focused in recent months on the growing culture of ‘binge drinking’, particularly amongst young people. While the health risks associated with this are well documented, what is less publicised is that drinking five pints of lager over an evening adds an extra 1,135 calories, nearly half a man’s daily energy requirement, and five bottles of an ‘alcopop’ such as Bacardi Breezer contain 990 calories, nearly half a woman’s daily energy requirement. Researchers from the Johns Hopkins Bloomberg School of Public Health examined the relationship between beverage consumption among adults and weight change and found that weight loss was positively associated with a reduction in liquid calorie consumption and liquid calorie intake had a stronger impact on weight than solid calorie intake. The results are published in the April 1, 2009, issue of the American Journal of Clinical Nutrition. Researchers conducted a prospective study of 810 adults aged 25-79 years old participating in the PREMIER trial, an 18-month randomized, controlled, behavioural intervention. Caballero along with colleagues from the Johns Hopkins School of Medicine; the National Heart, Lung, and Blood institute; Duke University; the Pennington Biomedical Research Center; the Kaiser Permanente Center for Health Research; the University of Alabama; and Pennsylvania State University measured participant’s weight and height using a calibrated scale and a wall-mounted stadiometer at both 6 and 18 months. Dietary intake was measured by conducting unannounced 24-hour dietary recall interviews by telephone. They found that at 37 percent sugar-sweetened beverages were the leading source of liquid calories. Consumption of liquid calories from beverages has increased in parallel with the obesity epidemic. Earlier studies by Bloomberg School researchers project that 75 percent of U.S. adults could be overweight or obese by 2015 and have linked the consumption of sugar-sweetened beverages to the obesity epidemic, which affects two-thirds of adults and increases the risk for adverse health conditions such as type 2 diabetes. Researchers recommend limited liquid calorie intake among adults and to reduce sugar-sweetened beverage consumption as a means to accomplish weight loss or avoid excess weight gain. In the UK, little government attention seems to be given to the impact of soft drink and alcohol consumption on obesity. The adverse health effects of excess alcohol consumption are well-documented but its effects on weight gain are underestimated. The effect of alcohol on obesity is not even mentioned in the Chief Medical Officer’s recent Annual Public Health Report, which created controversy by suggesting a range of measures to address the nation’s drink problem. “Easy access to cheap alcohol is “killing us as never before” and must be curbed with tough licensing laws, price rises and a shift in public opinion that makes being drunk as unacceptable as smoking”. If the UK government is not yet prepared to tackle the well-understood health problems associated with alcohol consumption, we clearly have a long way to go before its effect on obesity reaches the radar screen. 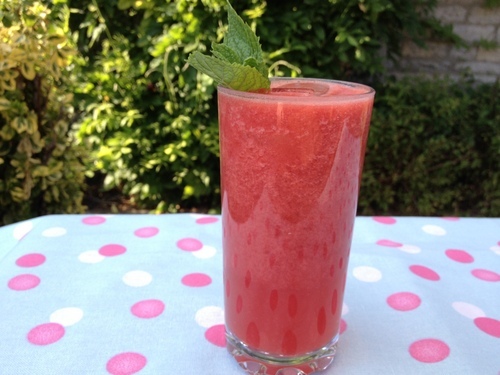 For information on the effects of different types of drinks on health and creative ideas for healthy drinks, please come to a Cooking for Health course, held throughout the year in Somerset, UK, led by nutrition expert Dr Jane Philpott.